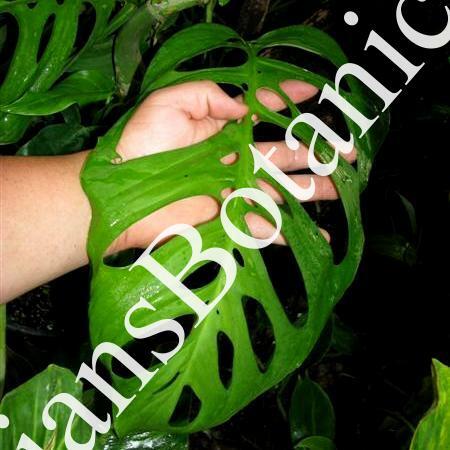 Monstera adansonii well like many things in life nothing is for sure. So are the names are Monstera species. A few common forms can still be easily identified but it seems few people can be sure of the correct names on many of these Monstera species due to the range of differences in seedlings and from juvenile to mature foliage. A small leaf plant can morph into a much different looking specimen in the jungle. With that said I am about 73% percent sure this is the right species. Large leaves with multiple open windows throughout the leaves. Once mature expect leaves 2 feet long and 1 foot wide. Plant prefers to climb and is not as fast and spreading as other species. I usually can only offer several plants a season due to slower rate of growth.? A great plant growing in a tropical climate or as a house plant or indoor conservatory.